Let Us Relate Newsletter, Issue #36: - December 2007 -- What is love? 1. Wanna know what love is? 1.What is this love thing? Love is more than a feeling - it is a permanent state of the heart, and spirit. Love is kind. It acts in the best interest of others. It overlooks offences. It is extravagant, giving more than what is asked or needed. Love does not envy, it does not boast, it is not proud. It waits for God to promote and exalt. I love loving and I love giving; which is why I jumped at this chance that my website host, Sitesell (www.sitesell.com/Offers1.html), has given us webmasters to give those of you that have an interest in writing, internet publishing/marketing or have a passion for something, a chance to get 2 websites for the price of one. This special, special offer is on as you are reading this and will end at midnight Christmas day - December 25th. It's your chance to show someone just how much they mean to you and just how much you respect and value their dreams and passions. Let me tell you a little secret: If my husband had been the one to give me SBI! as a gift, he would not ever have needed to romance me again - that's how much SBI! means to me - it would have been the ultimate gift of love, and a romantic one at that! Unfortunately for both of us, I discovered and subscribed to SBI myself. I am still extremely grateful for his love though and I love him for giving me his unfailing support in all matters relating to my passions in life. Don't waste your chances, go get SBI for your loved one - but only if you know they will appreciate this incredible gift and grab the opportunity with both of their hands. If your partner is likely to waste this chance, give it to someone else or to yourself. 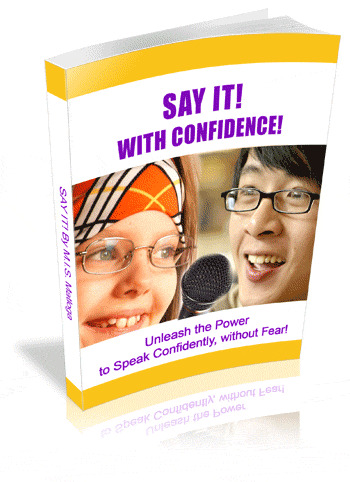 This ebook addresses common public speaking concerns such as 'fear of public speaking, lack of confidence, shyness, and gives tips on the dos & donts of public speaking.' It also has a section for kids and teaches parents how to motivate their kids without causing arrogance or destroying their self-esteem. This is an ebook you do not want to miss - especially if you have children. Visit www.public-speaking-solutions.com/publicspeakingebook.html to read more/learn how you can purchase the ebook - link below. Thank you for your unfailing support. Word of mouth grows us ~ if you liked this article, please pass it on to those on your mailing list, with a link to www.relationship-affairs.com. Protect your dreams and Stay Blessed! Curious to know how I built my site?